GOVI, Fabrizio, I classici che hanno fatto l'Italia. Per un nuovo canone bio-bibliografico degli autori italiani. With an introduction by Giovanni Ragone. Modena, Giorgio Regnani Editore, 2010. Size: 29,6 x 21 cm . Full cloth with color dust jacket. XXXV, 415 pages. With 12 color tables and numerous illustrations in the text. 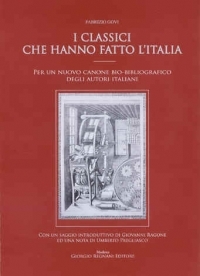 Similar to a famous work of the Sixties', Printing and the Mind of Man, in which the main fields of knowledge are described in over four hundred printed works that had a significant impact on the history of mankind, I classici che hanno fatto l'Italia (“The classics that have made Italy”), proposes an ideal library of Italian authors (for birth or of adoption), and at the same time aims to illustrate an outline of Italian cultural history from the Quattrocento to the present, through a very personal, but representative selection of titles and editions. The publishing vicissitudes of a text (be it an absolute masterwork, a pioneering work in its field, or bestseller of its time) have in fact twofold aspect: on one side they give information on the reception and the spread of a certain work after its publication (number of copies printed, reprints, pirated editions, counterfeiting, privileges, editorial agreements, etc. ); on the other they help to understand the mutual relationships between press and readers, putting in evidence that printing has influenced the very way to write and to read. Every book presents itself to the reader as a manufactured object appealing to both the eye and the mind mostly through carefully excogitated editorial strategies (size, printing types, illustrations, dedications, etc.). I classici che hanno fatto l'Italia is therefore not a generic repertory of the most important witnesses of Italian cultural history, neither a history of Italian printing, but rather a chronological review of the transmission through print of these witnesses and their consequent diffusion. For this reason the work does not address exclusively to a public of collectors and bibliophiles, but may also attract the curiosity of those who never has experienced the emotion to leaf through an ancient book or to read a text in its original edition. In I classici che hanno fatto l'Italia are found the descriptions, in chronological order, of four hundred works of as many Italian authors from the Quattrocento to our days. For every selected work a representative edition has been chosen (generally the first but not always), of which are explained its peculiarity and, whenever known, its background. In some cases also other important editions of a particular work are mentioned. Every entry not only describes the historical and cultural significance of a work, but is supplemented with a biographical sketch of its author. In an appendix are found the bibliographical details of each described work (size, collation, variant issues, etc.). The volume, equipped with a detailed analytical index and a selected bibliography, contains also an essay by Giovanni Ragone, Dal canone al mainstream, la nostra memoria attroverso i libri (From canon to mainstream, our memory through books, pp. XIII-XXXII), that discusses the transformation of the bibliographical canon in Italy from Quattrocento to the present; and a note by Umberto Pregliasco, president of the ALAI (Antiquarian Booksellers' Association of Italy), on the role of the antiquarian book dealer and collecting in general. Orders at Libreria Alberto Govi at the price of euro 65,00 (+ shipment).